I have a great fondness for Mexican food, and over the years have repeatedly attempted to prepare dishes that have been favorites since my first trip to Mexico. Pozole, mole, tamales, salsa verde, squash blossom quesadillas, guacamole, and cactus salad beget memories of time spent in a country laden with magical and tragic stories. Mexico’s potent ambiance is capable of stimulating all the senses. (Check out this movie)! Mexican recipes that inspire me to spend a good and long day in the kitchen require a bit of planning ahead, and may necessitate a trip to town, across the border, or happily, in some instances, just out to our gardens. Finding a good Mexican food store that carries a variety of dried peppers, hot sauce, corn husks, banana leaves, hominy, mole sauce and prickly pear cactus is always a treat, and an opportunity to stock up on ingredients that are not readily available where I live. While I still buy all of these ingredients when given the chance, I also grow a few that do well in our climate. That list is shorter, but it does include some essentials: a variety of hot peppers (very important! ); tomatillos (a snap to grow and three or four plants will produce more fruits than anyone would know what to do with); black beans (a must! ); cilantro (succession plantings are a good idea); and of course, epazote (an easily grown Mexican herb). Ah…but what about tortillas, the foundation for the smell and taste of Mexican food? Tortillas, made from masa harina (field corn or maize that has been treated in a solution of slaked lime and water and ground into flour), are undoubtedly the most basic Mexican food. Maize is a staple for all Mexicans and has been part of that culture’s cuisine for centuries and dates back as far as 10,000 years…a lot of history to think about while eating tortillas! I like to know the stories behind the food I eat. And, in the case of the lowly tortilla I have, admittedly, over-romanticized the historical and labor-intensive hand processing methods that at one time preceded the end product. The images that I have in my mind’s eye, of women bent over a grindstone, were long ago lapped by modern ones of machines that spew out corn tortillas, kilo after kilo. With strong memories of eating fresh tortillas purchased at a tortilleria in a small Mexican village, it is hard to be satisfied with the imitations found in the freezer section of our grocery stores. The disappointment that can accompany those tasteless rubbery discs is no more than an open invitation to seek out flavorful and pliable replacements. One obvious solution is to make tortillas at home using masa harina, which can be found in most grocers. I have tried several brands over the years. One brand had no information about the corn used, another stated that it was 100% natural, and yet another declared that the corn used is non-GMO and is organic (although that information is not on the package). I have happily used the later two interchangeably and love the flavorful results. For the time being. Since information about the corn used for the production of masa harina is not readily available, I am left wondering, why not? Commercial corn gets a really bad rap these days. With all the issues that surround it – GMO seed, soil depletion from the over-planted fields, fertilizer overload and subsidies – it is not a wonder. 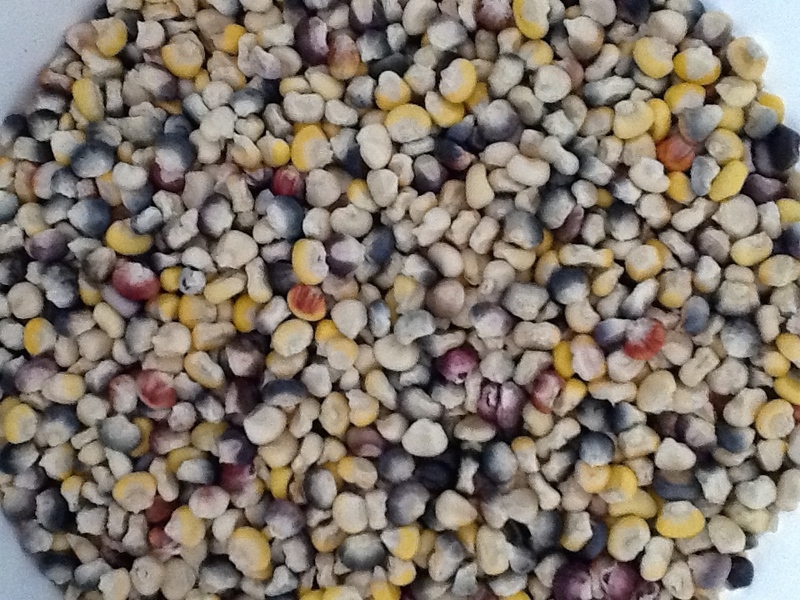 Not knowing, or not being able to easily find out what type or grade of corn is used in commercially produced masa harina, I have considered growing flour corn along with the sweet corn, popcorn and open pollinated varieties that we plant each year. If I did grow such a corn, could I make my own tortilla flour? My own home-made masa harina? I decided to give it a shot. 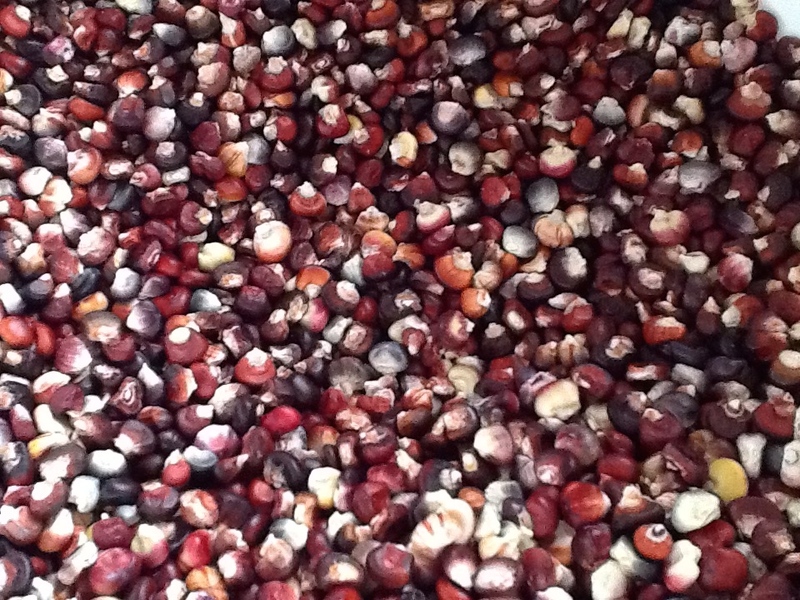 Mandan Bride, the flour corn that I planted, is beautiful to look at in its multi-coloured kernel dress. What an exciting moment it was last year, in late summer, when I tore back the husks of a cob to discover what laid within. Ideally this particular corn would dry on the stalk and in the field, but our growing season isn’t quite long enough for that to happen, and the birds like to have their way with it, if it is left in the field. So, we harvested, husked, hung the corn to dry, and admired its beauty until it was time to roll the kernels off the cobs. 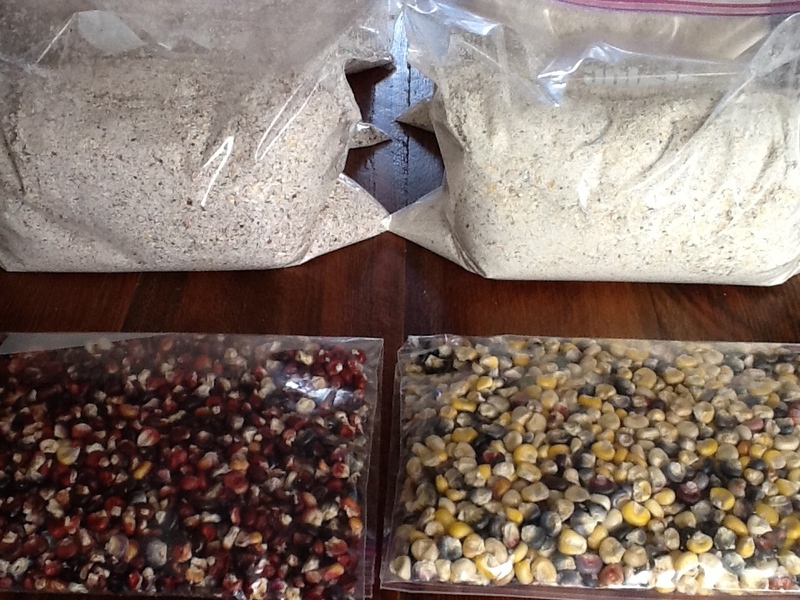 All the reading I did about drying and processing corn suggested that the dried kernels could be stored for quite some time, so grinding it into meal or flour, or soaking it in a slaked lime and water solution to make masa harina or hominy, could be left for a quiet winter day. Well, that day arrived mid-January. It made sense to start simply. 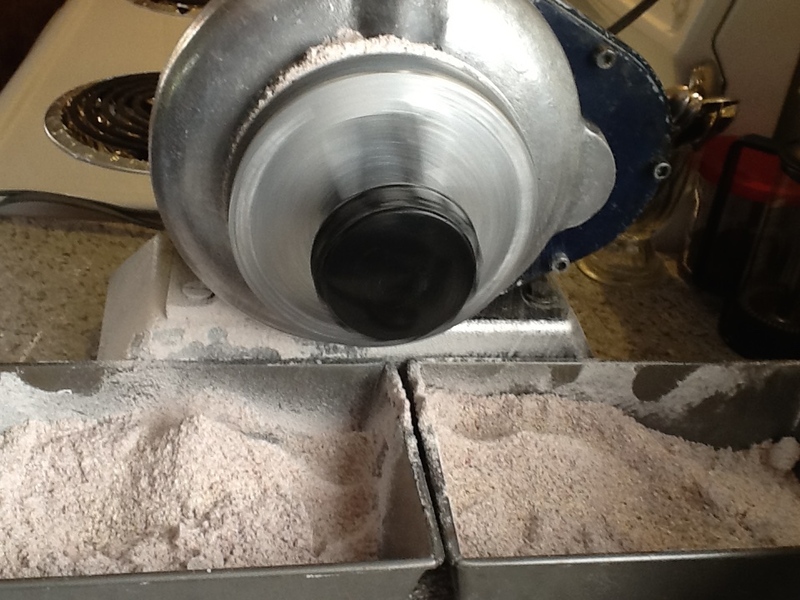 So, I pulled out the grain grinder borrowed from a friend; figured out how it worked, cleaned it up, and set out to grind some of the kernels. Never having processed any grains at home before, this was a special moment. A bit of adjusting to get the setting right was needed and I soon had a small pan full of corn meal. The smell coming off the ground corn was better than I could have ever hoped for and called for a taste test. The muffin follow-up made the growing, harvesting, drying, and grinding process seem like an absolute and worthwhile life necessity. Now, with the flavor test out of the way via the cornmeal muffin step, I can proceed to the next part of this corn project – attempting to make masa harina. Once I source the slaked lime I will be well on my way. Hopefully. And, I will let you know how that goes in Part 2. This entry was posted in black beans, chili peppers, cilantro, epazote, flour corn, hominy, mandan bride corn, masa harina, tomatillos, Uncategorized by against the wind farm & gardens. Bookmark the permalink. How about trying your corn tortillas without the lime? Just the flour…I am sure they would be delicious! It might work, but i love the flavour of masa harina. I did go the next step and have to follow up with the results – which sadly were not all that successful.